Well, I finally picked up a new pack to replace the Pacific Crest Denali that was riding too low and killing my shoulders after a few miles. I headed to Altamonte Springs and Travel Country. I met with Brian to go over the packs and spent the next couple of hours with him going through three packs. First up was the Gregory Z55. I really liked it and loved that fact that it shaved a full pound off my pack weight. Next up was the Deuter ACT Lite 65 + 10. This was neck and neck with the Gregory and looks like what my PC was used to model. Feature for feature they’re almost identical but the Deuter dropped almost a full pound weighing in at 3 lb 11 oz. The final contender was the Mountain Gear Koa. I couldn’t put my finger on it but I didn’t like it as much. Brian was very patient and kept swapping weight back and forth between the Gregory and Deuter. I don’t know how many times I walked around the store. 🙂 What was cool is that everyone on staff was very willing to help. Several of them would make suggestions or comment how one pack rode better than another as I walked by. It was a very long process but in the end I walked out with the Deuter. I think I’ll be very happy. I can’t wait to get some miles on it. The Deuter has held up very well over several extended hikes. The torso adjustment makes it pretty simple to get a proper fit for a wide range of torso lengths. There is a small zippered pocket on the right hip belt that is handy for holding a compass, first aid kit, or other small objects. 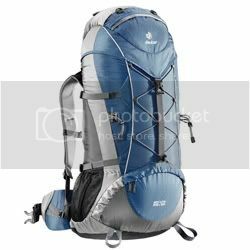 This pack has three compartments: top, main body, bottom. I use the bottom section to store my shelter (hammock, undercover, etc.) If you need a larger body section the floor can be unzipped. The top section has three separate compartments. I use the small outer compartment for my phone, car keys, headlamp, and other items I want readily available. The larger compartment stores my tarp, rain gear, and other quick-access items. The third compartment is on the inside when you flip the top pouch over. The body has a nice collar that allows you to stuff a little more in the pack. I find it useful when I have larger items during winter hikes. I’ve had no problem carrying my full load at 30-35 pounds. It’s a very comfortable pack and I see it being my main pack for a very long time. i live in the woods near atlantic gate . going to try to thru hiked the at in april of 2013. I’d say a good place to start is figuring out what your necessities are and working from there. I carry 30-35 lbs in this pack. There’s probably some stuff I could leave at home to shave weight but I carry them anyway. If your stuff is from 25 years ago it probably weighs a ton. As long as you can carry it comfortably that’s fine. Keep in mind that the terrain on the AT isn’t really like walking around Florida. Once you hit the GA/NC mountains you’ll be wondering why you spent your time walking on the beach (or wherever). Keeping the weight down makes it easier to cover more miles. My gear list (a bit dated so I need to update it) is posted in the Gear section. You can use that to get you thinking about what you might need.